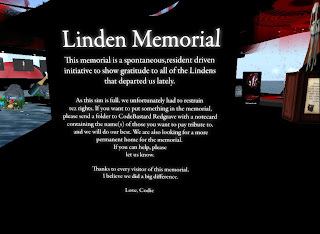 I have been making a daily stop at the Memorial created by CodeBastard Redgrave to the memory of the Lindens who have lost their jobs . Bixyl has already reported on the facts. It was spontaneously built, and I am afraid it will soon spontaneously disappear. There are always avatars visiting, walking around, and saying “oh no! Not her” or him … it is amazing. Most of the conversations in chat over the years, or even in the news at times, is critical of the Linden Lab for various reasons. But now, the warmth toward the Linden individuals who have been laid off is so evident. The Lindens who visit the memorial are seeing empty chairs and friends gone in RL and missing them. We inhabitants of SL are seeing names of some of those we threw snowballs at, or dunked at the Dreams Sim, or kissed on appreciation day. They were fun people! Some are especially revered for their camaraderie. 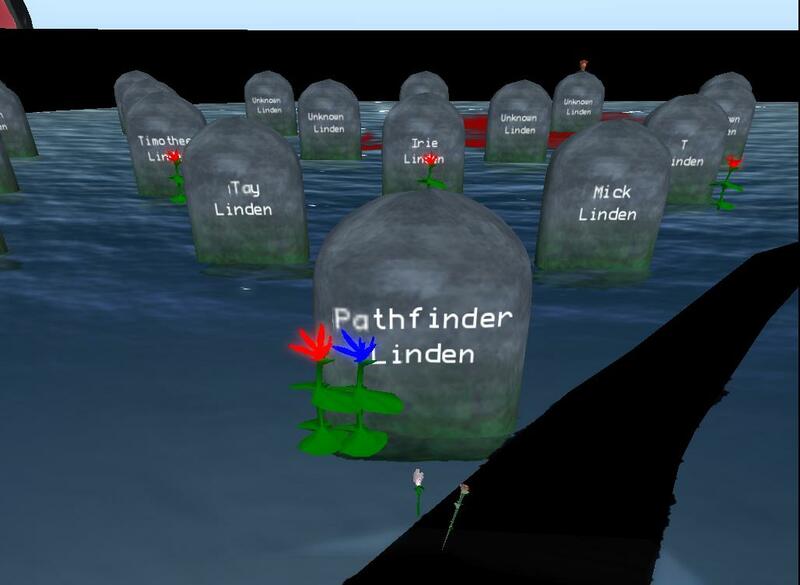 I was glad to see one there for Pathfinder Linden. He “resigned” a while ago because his job disappeared, and there was none other suitable for his skills and talents and compassion. Linden Lab is a business, and I guess must put business first. It makes one wonder though ... What is coming next?